Kit includes: ? 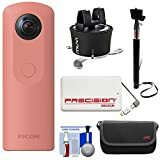 1) Ricoh Theta SC 360-Degree Spherical Digital Camera (Pink) ? 2) JVC CBV2013 Camera/Camcorder Case ? 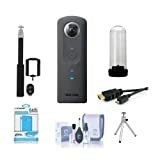 3) Veho Muvi X-Lapse 360 Degree Time Lapse Photography Gadget with Smartphone Holder ? 4) Sunpak 43" Selfie Stick Wand with Built-in Wired Shutter ? 5) Precision Design 5000mAh Power Bank Portable Charger ? 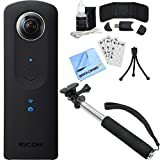 6) Precision Design 5-Piece Camera & Lens Cleaning KitExperience high image quality with high-precision stitching technology that delivers an astonishing 360-degree experience with the slim, stylish Ricoh Theta SC. The dual fish-eye lenses capture all of your surroundings with a simple push of a button. The 1/2.3-inch image sensor gives you approximately 14 megapixel output. The bright f/2.0 lens provides exceptional low-light shooting capabilities. Capture up to 5 minutes of Full HD 360 Degree video, which can then be transferred and viewed directly on to your mobile device or uploaded to social media sites. Live View function turns your smartphone into a viewfinder allowing you to preview what you are capturing. Create, share and edit images effortlessly with the dedicated Theta+ App and Theta+V App.The JVC CBV2013 Case is a stylish, soft, protective case for your camera, camcorder and accessories.The Veho MUVI X-Lapse enables a film maker to take up to 360-degree sweeping time-lapse images that when edited together create an amazing movie effect. It has both male and female standard 1/4-20 UNC tripod screw threads for both mounting cameras on and for mounting the MUVI X-Lapse onto a tripod.The Sunpak 43" Selfie Stick Wand with Built-in Wired Shutter is the fastest, easiest, most fun way to take great selfies and videos with your smartphone, point-and-shoots or GoPro.Elegantly designed, the Precision Design 5000mAh Power Bank Portable Charger charges your devices quickly and safely via the USB cable. 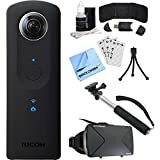 Features:Fit for Ricoh theta M15/S/SC/V camera.A mesh pocket to place small camera accessories.Made of splash-proof, shockproof and durable EVA, safe guard your camera.A carabiner to easy hook the case to bag/belt, free your hand.Lightweight and portable.